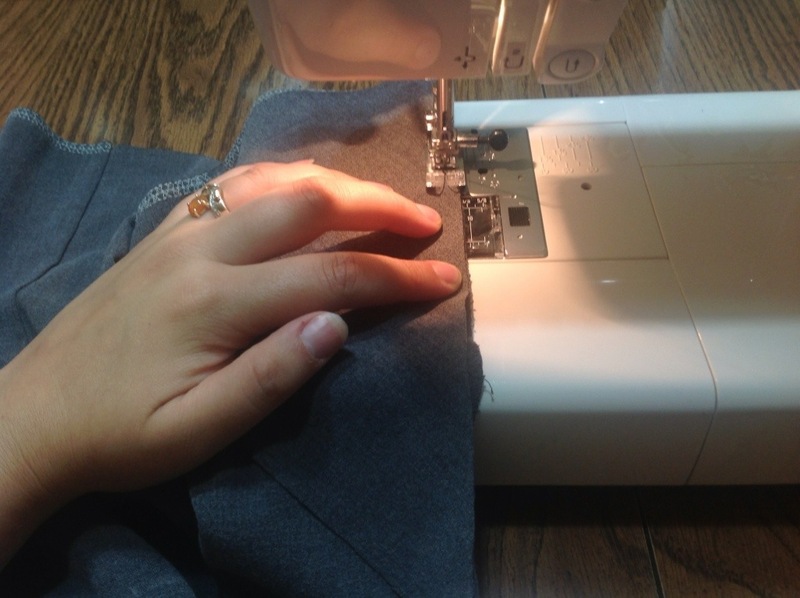 I have struggled to find clothing I like, so when I found the perfect skirt I decided to figure out how to make it a little better and make it myself with a refashion. I have been inspired to take things that don’t fit well and make them into the perfect outfit or piece of clothing. In the process I have had a few (ok, a little more than just a few) failed refashions and have decided that until I can get my dress form I must stick to pants refashions. After looking at how my favorite skirt is designed (just 8 rectangles, and 8 triangles), I took a few measurements and a trip to Goodwill. I also want to mention that this is a great example of a project that I started out doing one thing and realized that not only was I doing more work than needed, but that extra work also caused issues. 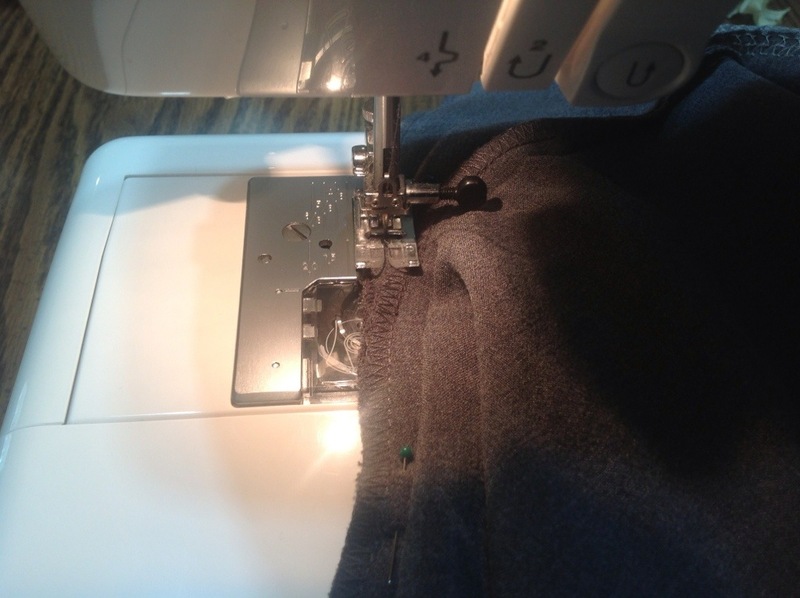 One of the things I like best about sewing is that it’s fun making mistakes…it’s the best way to learn! 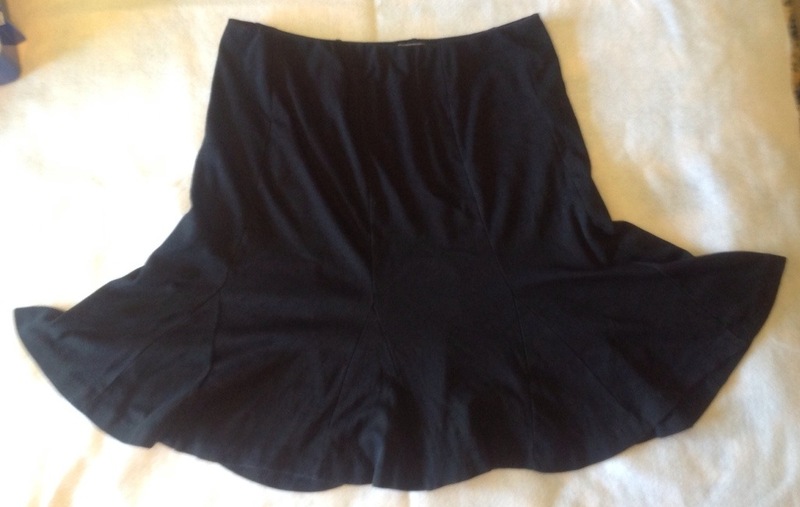 Here is the skirt, it may be hard to see in the bad lighting, but you get the idea. 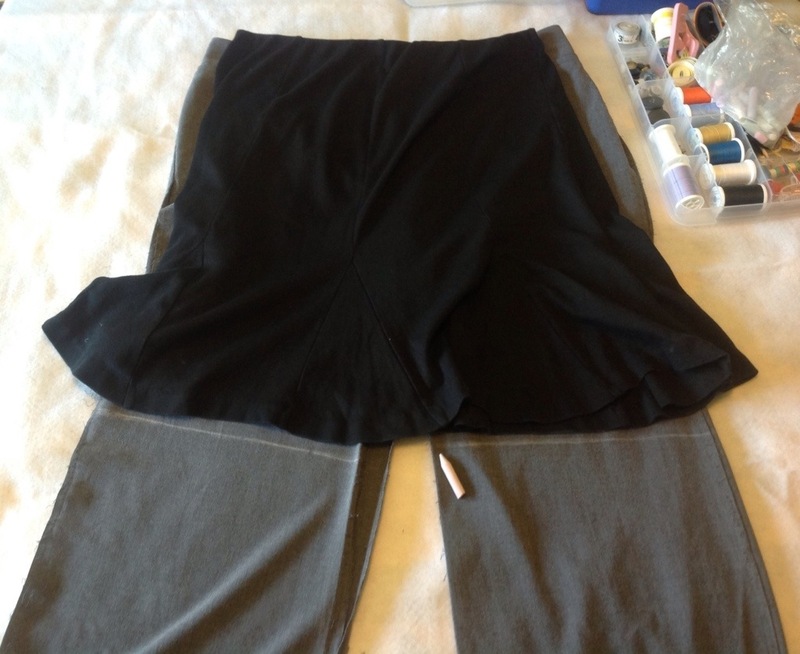 You may have even seen some Pinterest posts about turning a pencil skirt into a circle type skirt just by adding some triangles. 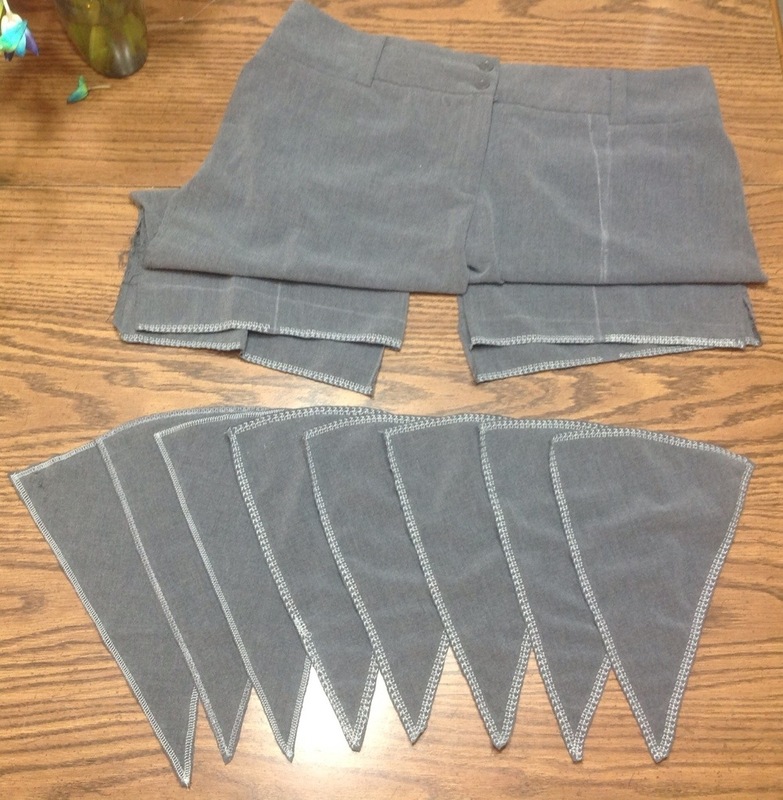 Now, I thought about two different ways to make the skirt. I could take 8 rectangles and completely re-construct it, OR I could take a pair of pants, rip the seams apart and go from there. 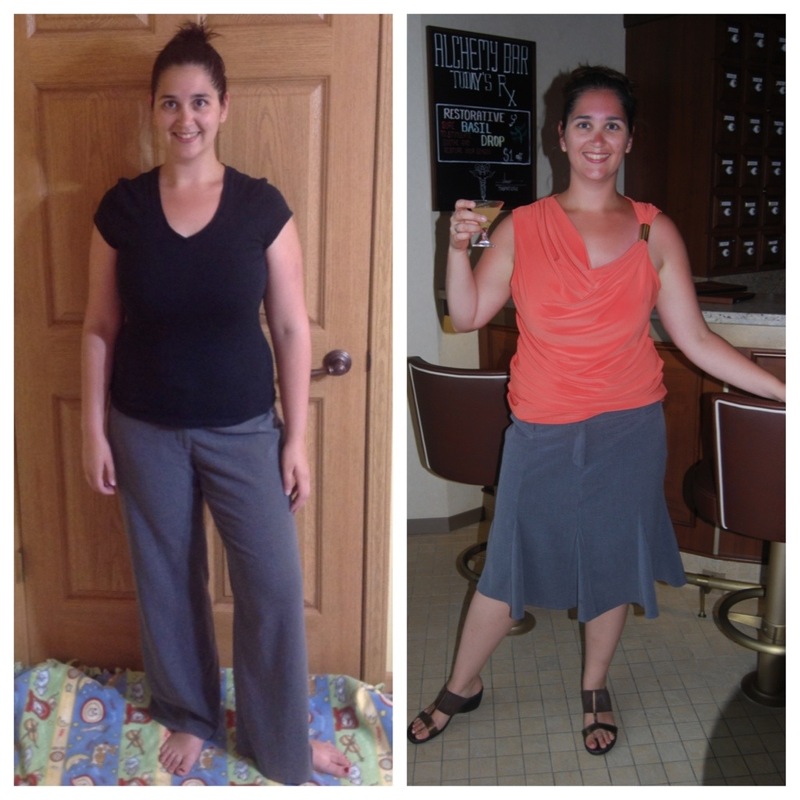 I chose that option because then I could make one skirt from one pair of pants! 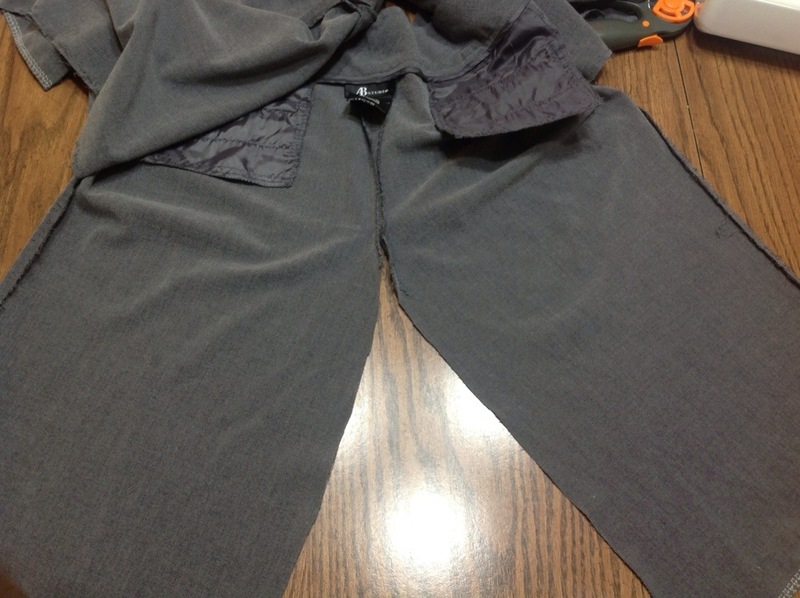 Now, Instead of cutting, I want the stitches completely removed so I can re-stitch on the same seams. Ready, Set, Remove Stitches! Both sides of both legs are un-stitched. See! Now, as you can tell the back of both legs aren’t rectangle. That’s an issue we will resolve later on. Next step is to figure out how long you want it. I took the skirt and laid it over the pants and used chalk to draw a generic line. 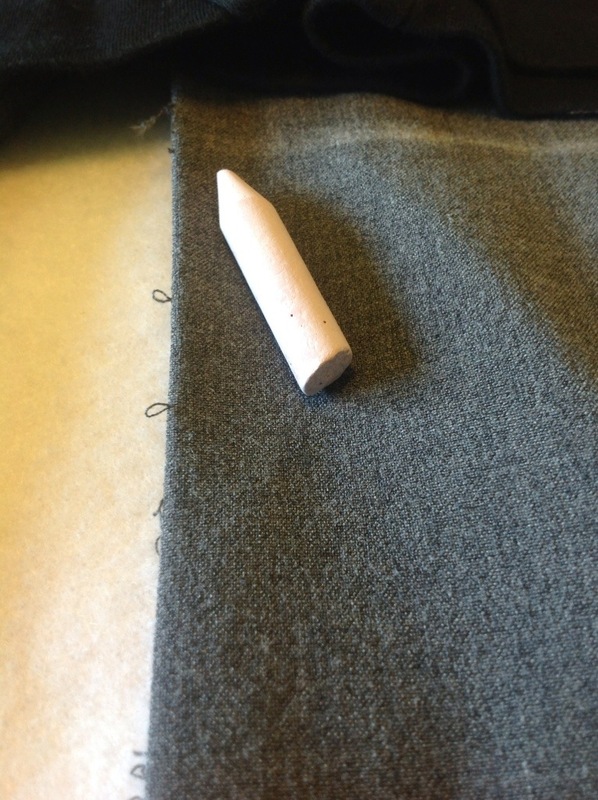 Then I used a rule to measure from the end of the pants to the chalk line, subtract about an inch for the hem then draw the REAL line with chalk. *Side Note* A little while back I saw a sewing tip on Pinterest that you can use a pencil sharpener to make chalk pointy and easy to draw with. I LOVE this tip. I can’t say enough about how awesome and helpful it is! And as I type this, it is school supply season, go out and get your own pencil sharpener just for your chalk now! 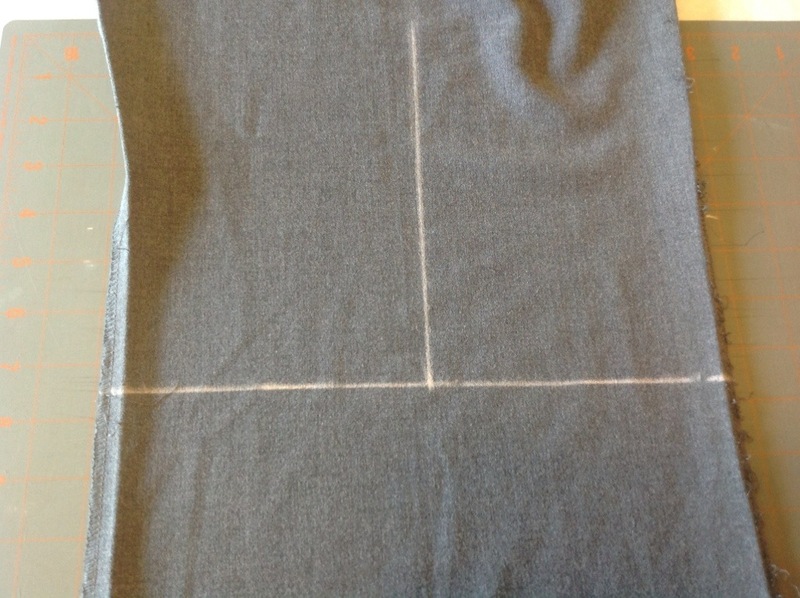 Once you have drawn the chalk line on all legs (I took 17 inches off the bottom) find the middle of each leg and draw a line up towards the top of the pants. Make sure you measure each leg, the back legs will most likely be wider than the front (at least it was for me). Why draw a line in the middle you ask? Right now there are only 4 panels, the skirt has 8 (and I like how it looks with 8). 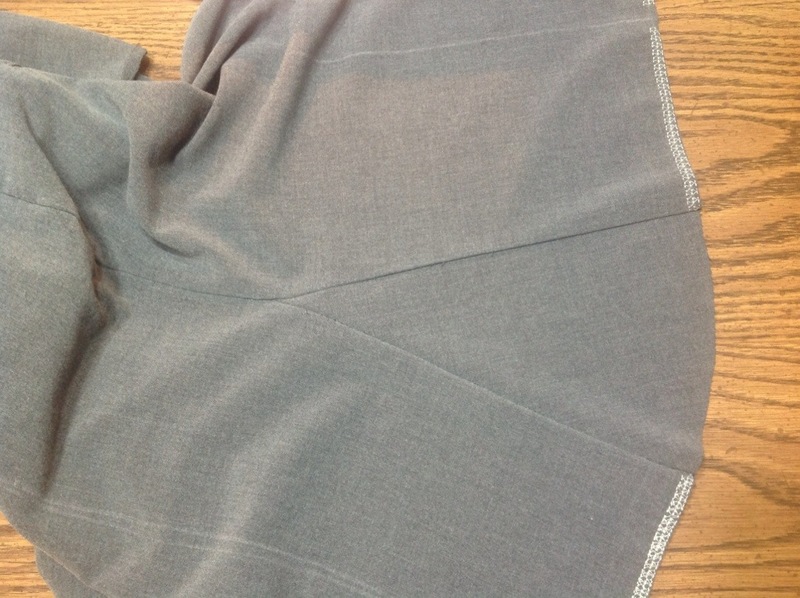 The next thing I did was pick a nice stitch to help reinforce the bottom of the skirt, something boxy. I chose stitch # 40. Later I switched to stitch # 32. * Don’t do this! I found out later that it worked better to NOT sew along the lines, so I cut all that off. Start at one end, then when you are almost at the center line reinforce the stitch, move over a little (without stitching) then reinforce again before finishing the last half of that quarter. Hopefully the picture clears up any confusion. 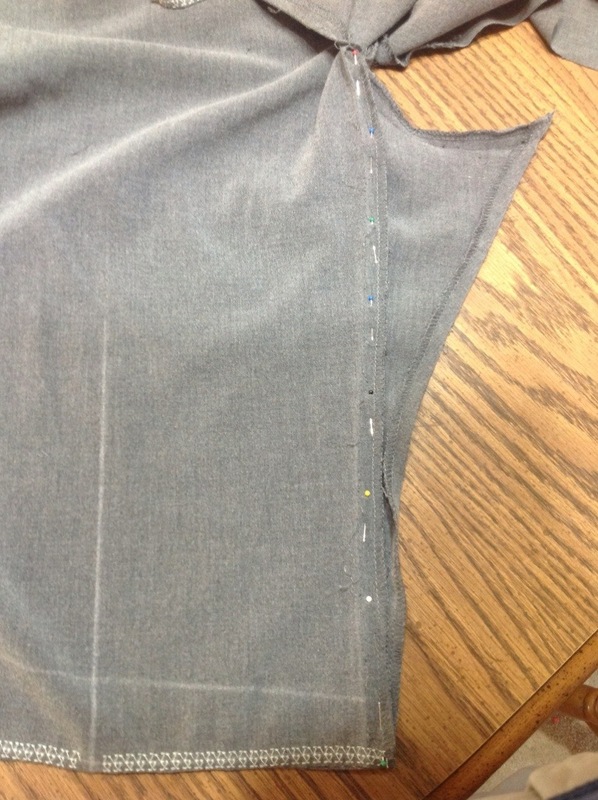 Cut along the bottom of the stitching. The bottom half will be used for rectangles. 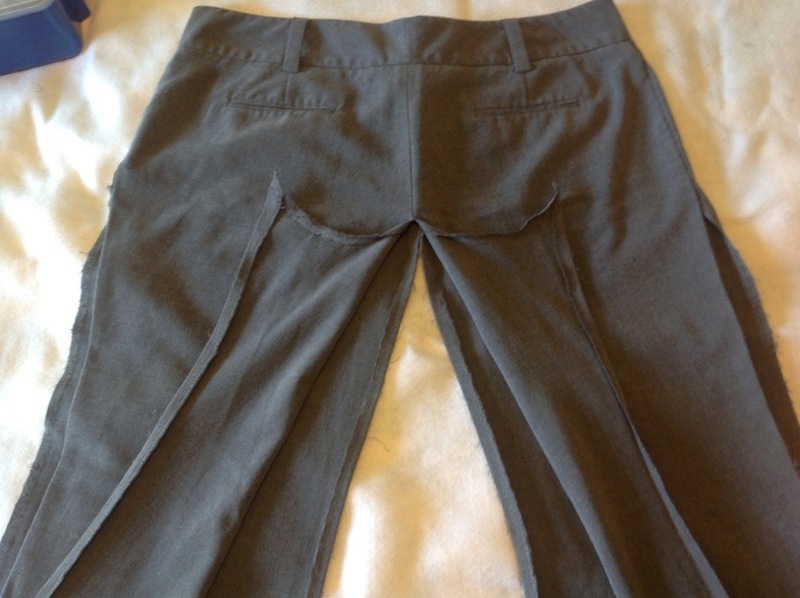 Time to resolve the issue with the back of the pants. I spent a bit of time pinning the front and back together in a way that it would make a straighter line in the back. I ended up pinning the bottom, then the top, then I fidgeted with the middle to line it all up. Patients is required for this part. Once it looks good cut along the outside, then take the pins out. Ok, time to move onto the triangles. I ripped apart an old folder. 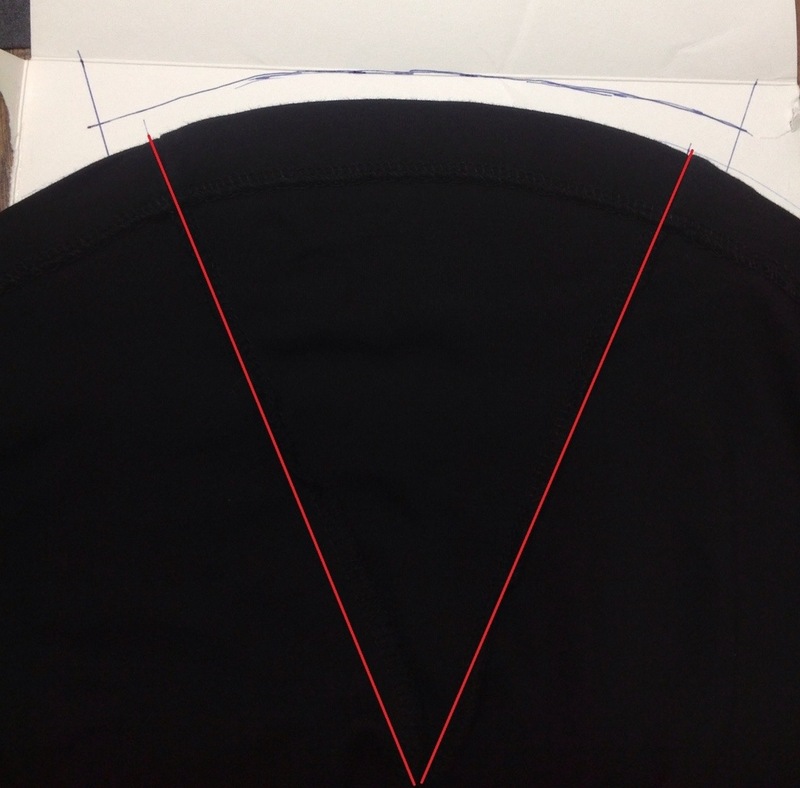 On the inside of one folder I placed the skirt at the top and traced the partial circle and marked the two ends of the triangle. Then I measured the width and height. I took the height and marked on the folder where the point should be. Then I used a straight edge to complete the triangle. Finally I added 1/2 inch to each side for the seam on my template. 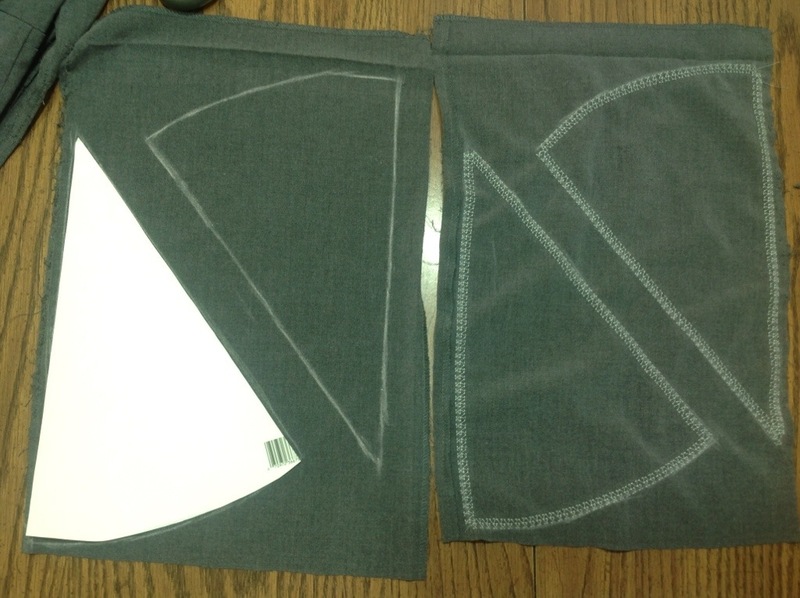 Cut out the triangle piece and now you have a nice new template, If you might even make the skirt again keep it! 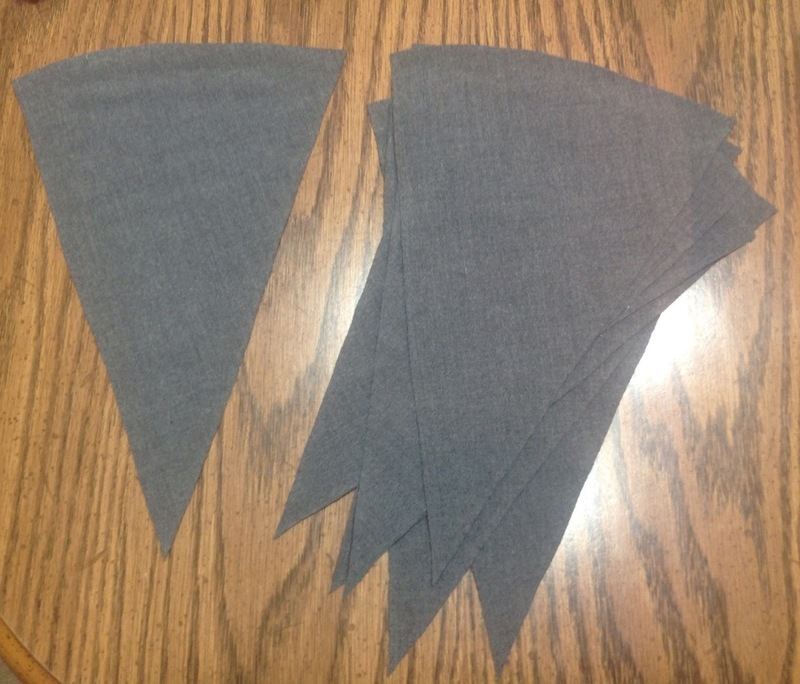 Use the template to trace two triangles per spare piece (4 pieces from the pants legs) I found out that two fit just fine, but depending on the length it may not fit two. If that’s the case, find another fabric that might work well with the original piece. 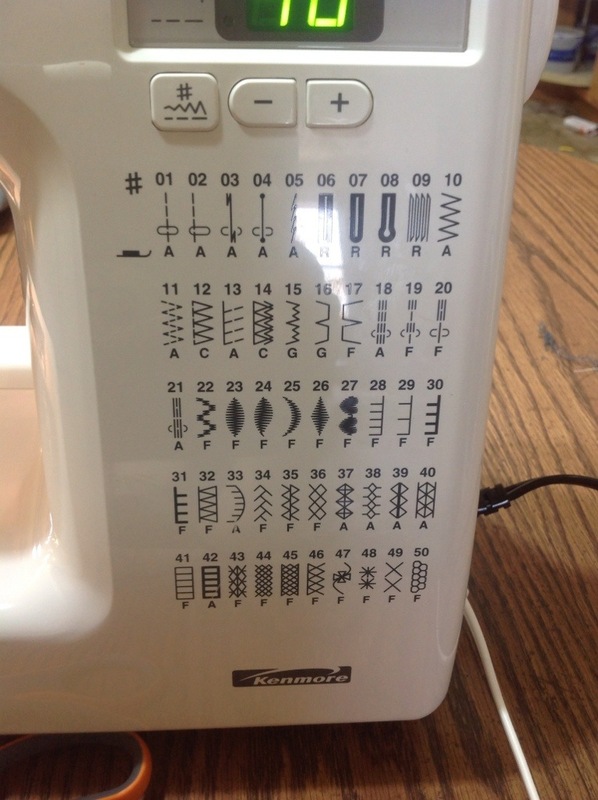 Once you finished tracing the triangles, sew along the lines. 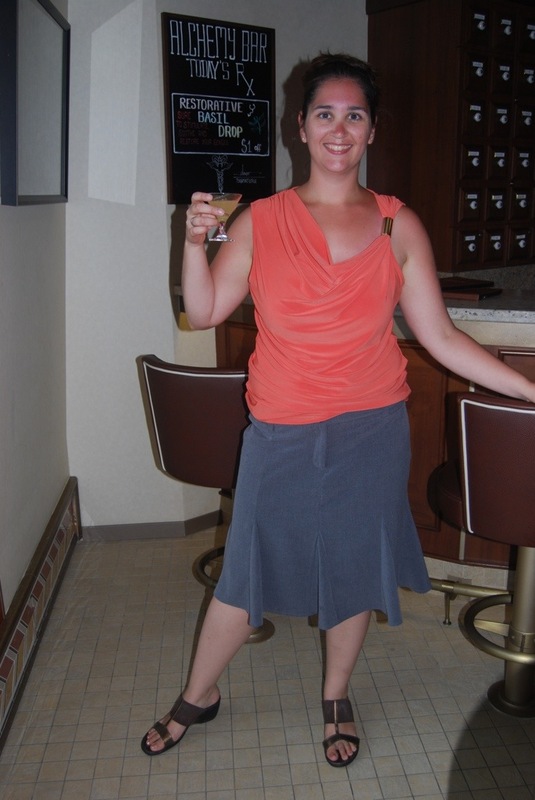 *NOTE, This was typed up and photos taken before the skirt was finished. Later I found out that when I sewed along the lines they didn’t lay flat and it didn’t look good. 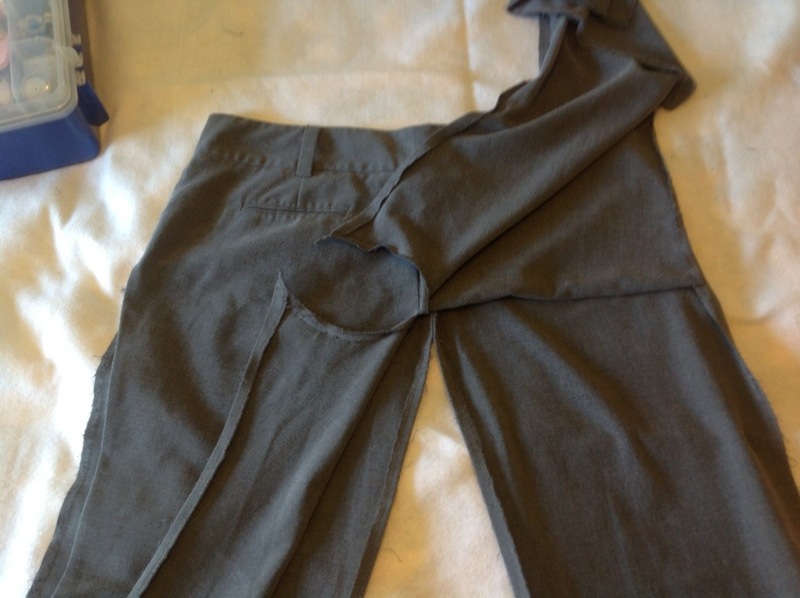 Just cut them out, don’t sew along the lines. Once you are done getting all 8 triangles ready time to piece it together. As I noted up above, the sewing along the triangles didn’t work out well. Instead of removing the stitches I just cut them off. I think I just like to make things harder for myself! 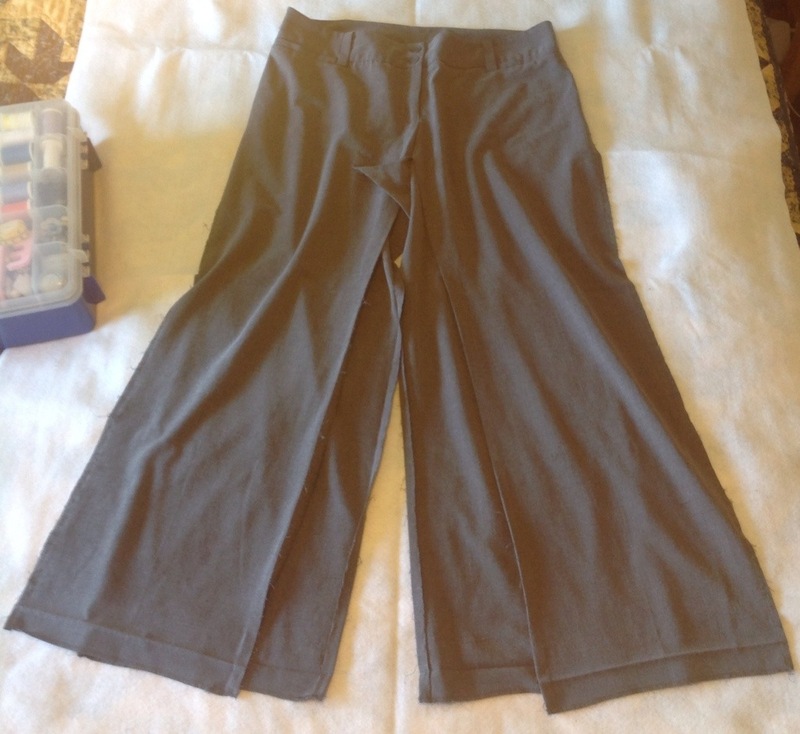 Before I got too far into sewing I pinned them up to see how it would look, and to make sure I knew how to sew them. I decided that I would sew one side of the triangle on, then pin the last half. 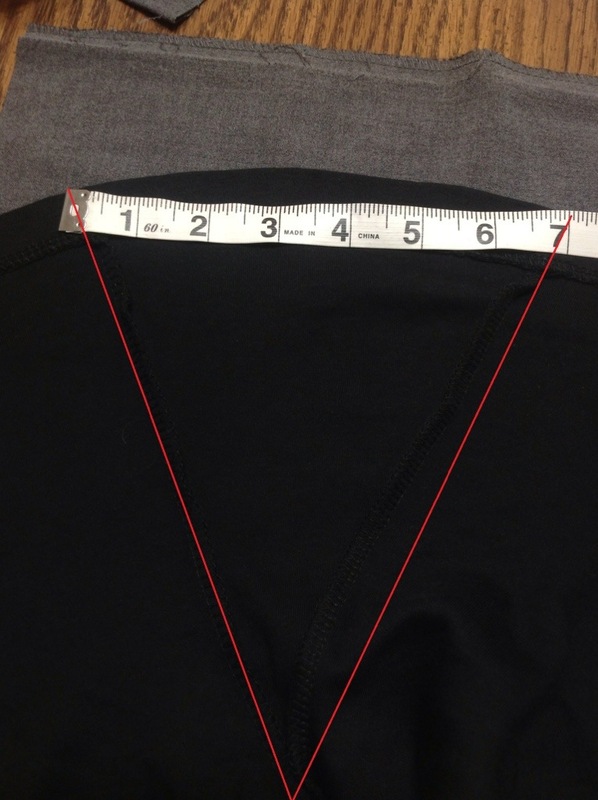 Make sure you pin well at the tip of the triangle. It should be folded in half with a pin keeping that part together. 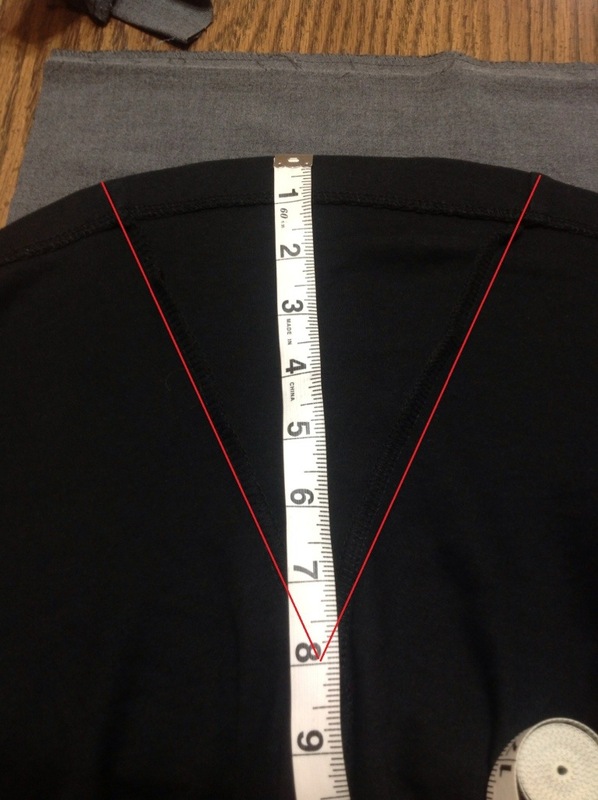 Then (see the third image below) as you get to that point, hold onto the tip of the triangle tightly after you take the pin out and make sure that the first side that was sewn is folded over and out of the way. 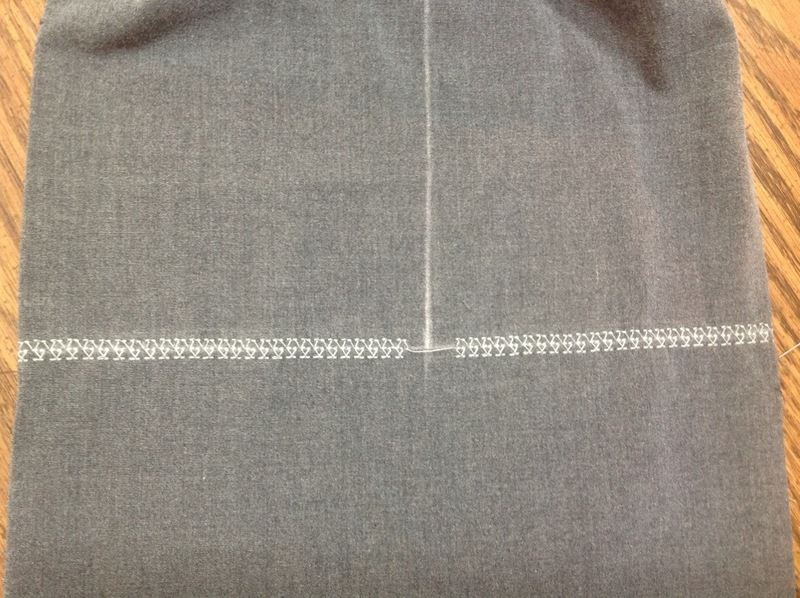 You will overlap a very very small part of that first stitching. Here is what it looks like after finishing the first triangle. I would suggest doing one triangle at a time. I did the first four triangles in the open spots first, then I moved to the last four (that would have to cut to insert). 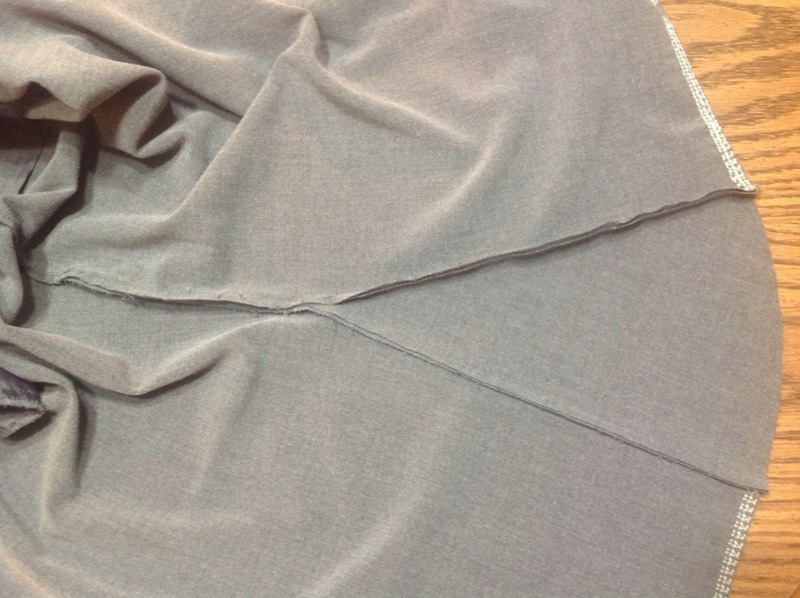 The two sides will be the easiest to complete, the back will be challenging depending on how well you eliminated the excess fabric. The front might also be challenging. After doing the front this is what it looked like. 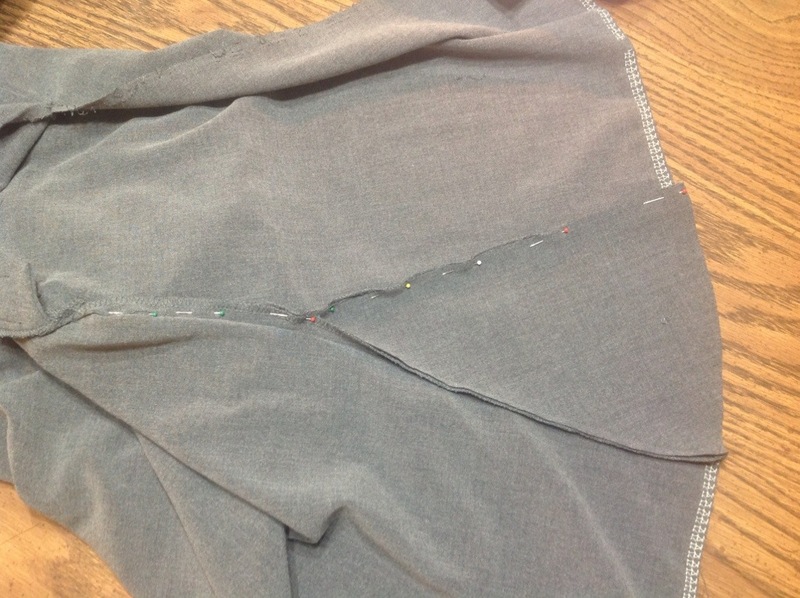 I resolved the issue by looking at where I would need to sew a little extra. After the first four triangles are in it will start to look like a skirt, but it might still look a little funny. 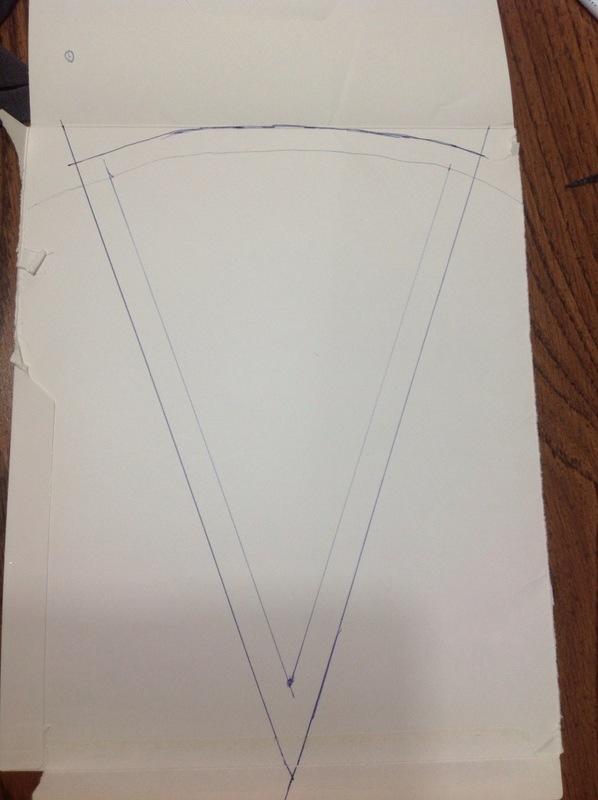 For the 4 triangles that need to have the sides cut to sew them in I looked at where the line is that I drew, and where it would look with it being sewn all the way to the top. 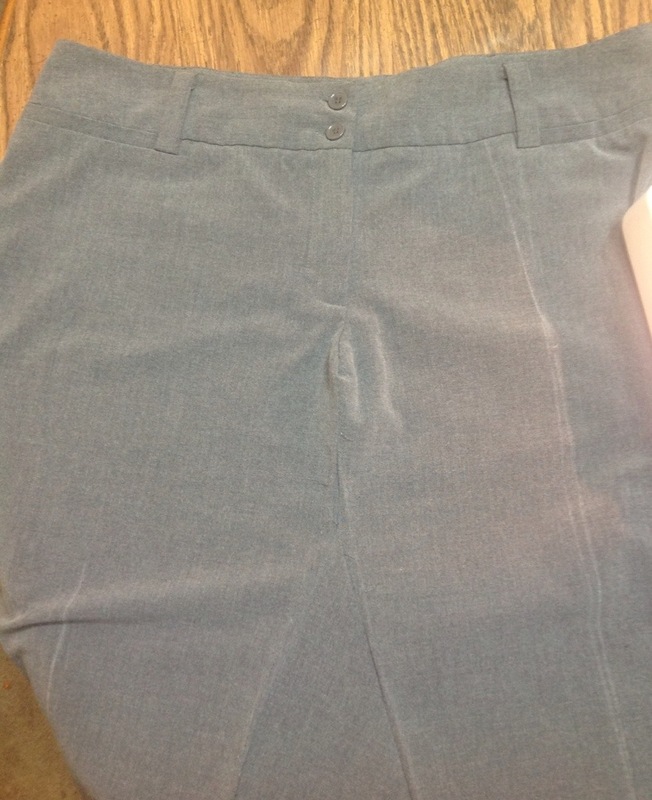 In most cases it looked good, but in the back I adjusted it a little to line up in the middle of the back pockets. 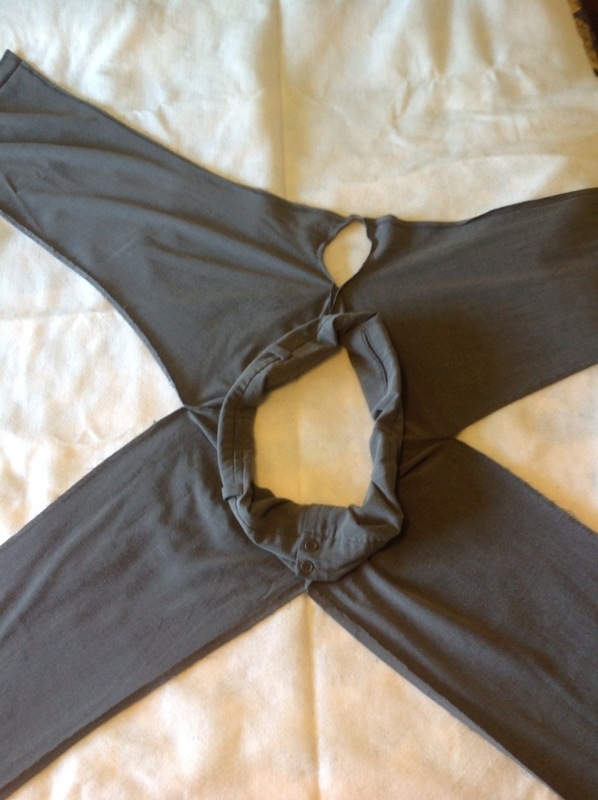 Once all of the triangles are on, try the skirt on to see if any areas need to be adjusted. I found a few, and fixed each. 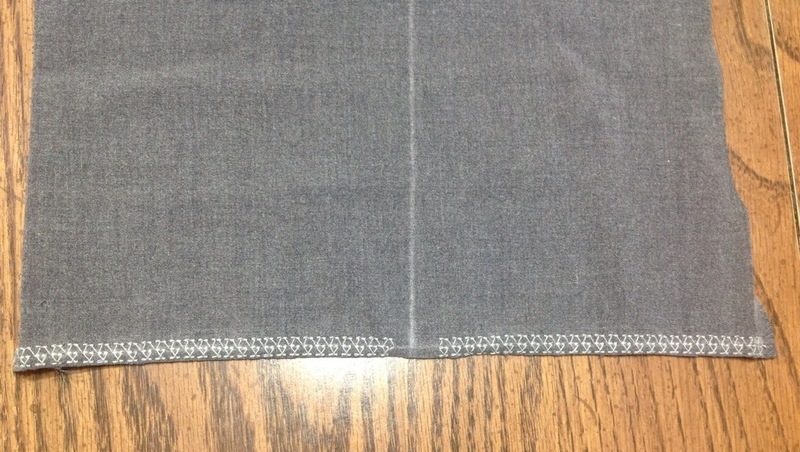 When you are happy with the skirt, try to iron the hem of the skirt. I found it difficult so after ironing a few sections I sewed once around. 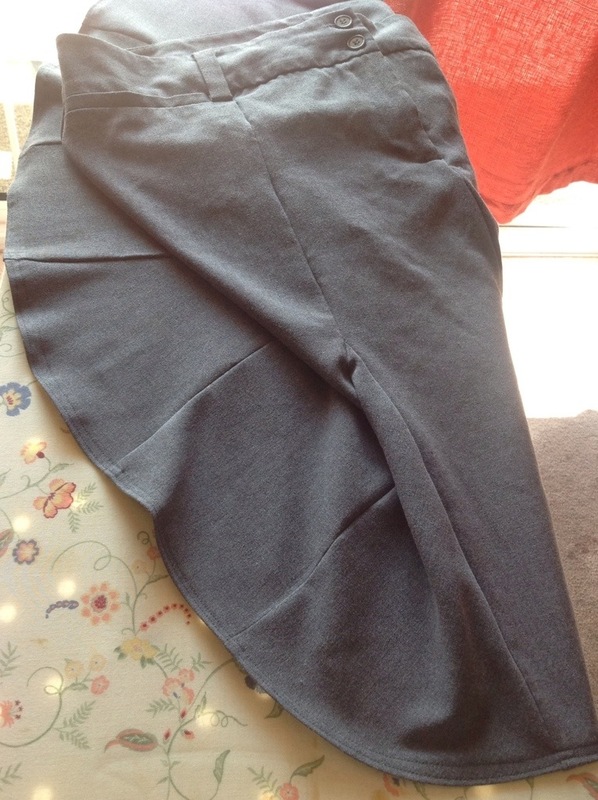 Then I ironed the hem then once more I sewed around the bottom of the skirt. And that’s it. I LOVE my new skirt!